NEW NSX STEREO MODIFICATION IS HERE AND BETTER THAN EVER! Don approved that I share our phone call after his stereo was modified and reinstalled by the Acura dealership! Plug and Play - goes in exactly like it came out - no dashwork, rewiring or extra install costs. Very convienient for those that like repair projects predictable and not never ending! IMPORTANT NOTE: If yours has the "A. Select" button then it will be used like the above US version. Switzerland, Norway, Belgium, The Netherlands, and other countries. 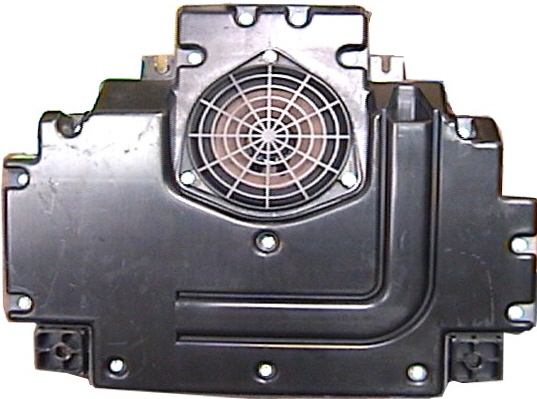 Know that on 1991 - 1997 vehicles, your static and popping may be coming from the stereo head unit needing repaired. If you know that you have good amps and still have a sound problem then it will most likely be the stereo. If that is the case then the best thing to do is unplug the battery until you get a chance to remove the stereo. This removes the constant power (even with car ignition off) which will continue to short out the radio. These can get so bad that they aren't repairable so get the stereo out as soon as you can to improve the chances of the stereo being repairable. What is the warranty on your work or new amps? We've always had a 1-year warranty on new equipment and on repairs. However, our new amps really can be lifetime warranty, they should last 15+ years, just let us know if a new amp ever gives you trouble and we will help. Replacing your bad amps with the new amps really is the long term solution. I've heard the Bose amps are built bad, with cheap components? The factory amps are awesome and after 8+ years they need to be replaced with new ones. Not much different then the aftermarket systems that get changed out every few years. Replace the amps with new and be done with it - no hassles. But they have already been worked on before? We have seen all kinds of things done by shops to attempts to repair these amps. One NSX owner sent in the door speakers from the St. Louis area. He complained that the speakers haven't sounded good after they were repaired by his local stereo shop. They weren't balanced L to R either. The shop told him it was because of a problem inside the head unit. The customer lived with this for a long time then when the speakers sounded really terrible again, this time he sent them to us. He also sent the head unit (because he was told it had a problem). The head unit tested fine and we could easily see the problem. The amps that the local shop put into his NSX were old amps from the rear of a Nissan Maxima. That's pretty bad and unacceptable and not to make excuses for the shop but we all know there hasn't been much support for the independent shops, trying to help the owner. The result of this makes it a hassle for the owner and amps that keep going out. Another situation was a shop put in one of those generic BMP001 or whatever they are called - those sound terrible. The distributor in FL for these, when trying to sell us on using them, said they were good because the customer is glad just to have sound and no popping - wrong!!! Those amps are not 50% as good as the original ones. We�re all about keeping it original. That is important to some and not important to others. There are plenty of aftermarket options and companies; we just don�t do that here. Price for repairing an amp? In previous years, we�ve away from repairing them since replacing with new is best for long-term dependability. We haven�t had one problem yet with the new ones, and when we were repairing them�(let�s just say that wasn�t always the case). We have repaired a few for people that just want cheap because selling the car. When we do that the repair charge is $120.00. So, you could send them in using the form up top of the website, approve $120 each and we will repair instead of replace with new. Most places that repair them advertise long term solution, and a better repair then every place else. The repairs really are about the same, no shop is going to use cheap components when they only cost pennies to get the best, it's just hype and advertising. Do you supply new amps? Yes � Current price is $220.00 exchanged per amp (there are 3 total in the NSX). Are they NSX specific? If not, which car are they specific to? Yes - OEM NSX � New design and upgraded components The exact amp that you would get from the Acura dealership. Average turnaround time? 1-3 days when Bose amps or enclosures are sent in to have the amps exchanged. Require amp only or whole enclosure? If someone sends either the old amps or the full speaker enclosures in here, we make the exchange and send it right back out for the $250.00 exchanged price per speaker. The price does include the return shipping as long as you take it ground or Priority Mail. Next Day or 2nd Day Air is usually about $20.00 - $30.00 additional in US. Average drop/delivery time? NSX owners can just order new amps or speakers at by calling 469-888-8706. If we send out new amps without having the old one here, then we ask that you just return the cores once they have been removed, we use them for other applications then the NSX. By receiving the amps before you even start taking anything apart then the door panels only have to be taken off one time, and can be put right back on. The speakers are usually still fine but now that we are getting over 25 years old on some, we would replace that speaker also. New speaker cones are not required for it to sound great again. Do you give core credit on old amps? We haven't been charging the core charge for the new amps. We have been just asking the buyer to send the cores in once done with them. Only when someone has paid the core charge of $35.00 do we offer a credit. Of course there is no core charge when an old amp is sent in and we just exchange it. What do you do with the cores, rebuild them? Yes we do, but not for the NSX, we have other vehicles that these amps can be used in. Thank You for the replacement amplifiers. My stereo sounds well again. Prompt shipment was greatly appreciated as well as prompt refund of core deposit. For any NSXer that needs replacement amplifiers for their stock BOSE stereo, I highly recommend Willman's Electronics. Daryl is a true professional. I have had a �92 NSX for 6 months now, and like so many others it had Bose amplifier problems. The driver door appeared to be working, but the passenger door was very quiet sometimes and then would make loud screeching noises followed by silence. I did not even know I had a subwoofer or center speaker until later reading about the amplifier problem. When the OEM passenger window regulator finally broke, as I hear they all do (but what are the odds�the car�s 12 years old, and it breaks the 15th time I roll it down,) I decided to do something about the speaker too. I began exploring my options, which seemed to be limited to $800 per from Acura, $150per from Willman�s Electronics, $120 for a generic �BRA001� replacement amp, $110 to have someone �repair� my amps, or an undisclosed amount and time for Bose to repair my amps. I wasn�t about to think of re-engineering the whole car to accept an after-market stereo. The Acura fix was just silly, and I know that these amps are tuned for their specific installation. First off I'd like to thank you and the great people at Willman's Electronics for the superb customer service and help dealing with my problem. I was greatly impressed that you spent the time to check out my unit and not charge me labor, for which I would have expected to pay. Having pulled the unit and now replacing it back in the car, I can say that it shouldn't take more that half an hour to pull or replace the radio.